There are so many great benefits you can get out of networking. Whether you are trying to grow your business, expand your career, or simply connect with more people in your niche, networking is a must. It’s best to surround yourself with people who have similar professional goals as you and are doing great things so you can learn from them, share resources together, and motivate each other to succeed. Having a network has helped me out so much in my business and it feels good to know people who can understand what I go through professionally and it also doesn’t hurt to receive referral and recommendations from my network. On the contrary, sometimes networking can seem like you’re buying a connection in a sense. If you have to pay for expensive conferences or take someone out to lunch in order to establish a connection, networking can weigh down heavy on your wallet. While paid networking events are a great way to build your inner circle, there are many ways to network on a budget as well. 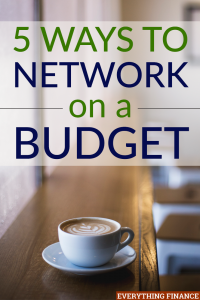 Here are a few things you can do to network on a budget. If there are free business and career events in your area, be sure to attend them so you can meet other people in your niche and in your area. You can search for events on sites like MeetUp.com, at your local library, or even at local colleges and universities. Since I run a small business, I search for events at local co-working spaces and free workshops so I can meet other people. If you live near a large city, you are bound to find plenty of free networking events to choose from. If you don’t, be sure to double check in neighboring towns, at a community college, your local chamber of commerce, and online to make sure you aren’t missing anything. There are tons of webinars going on all over the web each week and many of them are absolutely free. If you follow an influential person or just want to learn something new and connect with like-minded individuals, be sure to attend a webinar so you can learn something new and connect with the host. To engage, all you have to do is ask questions and give feedback when the webinar hosts asks. Every webinar is ran differently. Some people like to see who’s on the call and where their from while others don’t. One thing you can always count on in the end, is a Q and A session with the host. Be sure to bring all your questions then follow up with him or her after the webinar and connect with them on social media. If you can’t afford to attend networking events like conferences and paid workshops, see if you can volunteer there instead. Running the registration booth or handing out free swag can help you get your foot in the door so you can watch the presentation, and still meet people and slip them a few business cards. If you’ve been dying to introduce yourself with someone and get some one-on-one time with them to establish a connection, ask if they’d like to meet up somewhere that won’t cost either of you any money. Great locations to meet up to talk include a free local museum, a nearby park, or even a lounge area in a college. If you can’t find anywhere cool and free to go, you can also stop by a coffee shop and purchase something small so you can use the space to talk. Social media is a great free way to connect with others. You can join Twitter chats, participate in Facebook groups, connect with others on LinkedIn, and more to build your network. I personally find Twitter chats and Facebook groups the best ways to network. Last year I formed a mastermind group with a few individuals who I got to know better from Facebook groups. We all live in different towns and don’t see each other often, but they’ve all been great people to have in my network and they help me so much. Networking doesn’t have to cost an arm and a leg. You don’t have to run out and buy a custom suit or new casual business wear in order to meet people in your industry and add them to your network. Networking is all about connecting with people. You may not connect with everyone you meet which is why you probably shouldn’t focus on attending a ton of events and conferences. Keep it casual and take advantage of the free and cheap resources available to you in order to network on a budget. What’s your favorite way to network on a budget? How often do you network?